It's a Wonderful Life (1946): Is It a Wonderful Movie? When you feel sad or full of frustration and despair, it would be a good time to watch this movie. It's a Wonderful Life is likely to bring back your vitality and trust in yourself and people. It is one of the classic films that will never grow old or boring and despite being shot in black and white Frank Capra's picture is full of color like not too many movies. It shows how valuable the life of everybody is although this fact is often obscure and unrealized by many of us. After seeing this film, a man could think of himself as a more important part of the society and probably raise his own self-esteem considerably. It's a Wonderful Life is about a guy with dreams who has never had an opportunity to realize them. George Bailey (James Stewart) has spent his entire life sacrificing his longing for travel, his honeymoon, his perspectives of better career and more money in order to help his fellow-townsmen against the greedy and heartless Mr. Henry F. Potter (Lionel Barrymore) who would love to take over the entire city making its citizens dependent on his will and loans. During the years, George becomes more and more frustrated and finally reaches to a point when he is thinking about suicide in result of an unfortunate event. But thanks to the prayers of his wife Mary (Donna Reed), his uncle (Thomas Mitchell), his children and other good people, a wingless angel named Clarence (Henry Travers) comes down to help George in an unusual way. If the synopsis above has started to sound like a fantasy movie, you can indeed consider the film to be a product of loose imagination. But the presence of fantasy elements only helps It's a Wonderful Life to communicate its main message in a superb and effortless way, and to finish on a high note. The movie does have a happy ending but it is mandatory in this case and since it is anyway a fairy-tale-like film a happy ending fits it better compared to many other Hollywood pictures. Director Frank Capra is at his best here. The movie has plenty of funny moments in parallel with a good portion of drama. We see George's inner fight multiple times when he is standing on some of the crossroads destining his future life. James Stewart makes one of his greatest performances here and he is a fantastic match for the role of George Bailey. George's romance with Mary Hatch is both beautiful and humorous. Donna Reed makes a good portrayal of one of the Bedford Falls' longing-for-George girls and his future wife. Lionel Barrymore is a convincing "villain" and Thomas Mitchell presents likeable impersonation of Uncle Billy. The movie deservedly has been nominated for the Academy's Best Picture award but not so fairly it has missed to win the Oscar statuette in this category similarly to all other Academy Awards it has been nominated for. 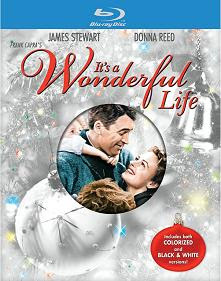 It's a Wonderful Life is a tale for adults but it is a suitable film for the whole family. What I mean by labelling it "a tale for adults" is that if you have some real life experience, you'll be in better position to appreciate this movie's message. The film should definitely help you if you are in a bad mood and think your life is a failure. It can surely kindle your thirst for living once again if you are in one of those unhappy periods of your existence. But as it should be expected from each and every great motion picture, It's a Wonderful Life is a movie you can delightfully watch even when your life is in a marvellous condition. It's a wonderful cinematic experience you can try out anytime. To read another movie review examine our Review Maze.